At last, it's time for the long awaited sequel to my top 10 NES Games list. Or as I like to call it, "Top 10 Mega Man games". And I'll be damned if I can't find some way to fit as many Mega Man games as possible into this follow-up. As a reminder, this is based on how much I like each game. I don't care about popular opinion or legacy when considering this list. It's all based on my personal feelings that can and do change with time. And because I'm a snobby hipster that thinks he's too good for your filthy mainstream games, Chrono Trigger isn't on the list. Or Super Mario World. But don't worry, this thing is packed with Mega Man and Donkey Kong. I only play SNES games because I think it'll make me look eclectic. 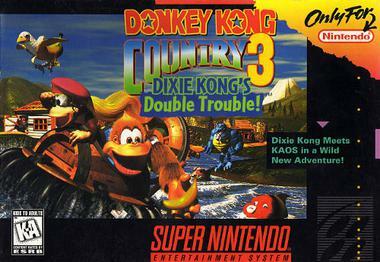 For their third Donkey Kong Country game, Rareware decided to mix up the formula by adding in more "gimmicky" levels. Running from giant saws, leaping out of the water before lightening strikes, guiding a frightened elephant through a shack full of mice, and dodging hot rocks that are thrown from the background to the foreground- it's creative stuff. Instead of trying to replicate what the more straightforward style of the other two DKC games, DKC3 creatively augments the core platforming with a variety of new mechanics. Not all of them work, but the successful stages make this game well worth playing. I just played this game for the first time recently as part of my Metroid marathon and it was a great time. The world is tightly designed, the soundtrack is sweet, and the whole thing gives me this "quintessential Metroid" vibe. What I mean is that if you wanted to find one game that represents the core of the series, it would either be this game or Zero Mission. The SNES is known for having great RPG's. Among the most popular for the system is Final Fantasy VI. This game created an interesting and emotional story with compelling twists and a shocking mid-game event that permanently alters the world. Final Fantasy VI created an impressive sense of stakes that few Final Fantasy games have replicated before or since. Almost every single character is fleshed out and has some interesting backstory, and seeing how that informs both their character in the present and how they cope with that aforementioned mid-game change is interesting. I don't find the gameplay to be anything special, but the characters and narrative more than make up for that. Final Fantasy VI is a storytelling landmark for video games and is well worth playing today thanks to its emotional character moments and well written cast. Probably the most controversial entry on this list- especially since it's above Final Fantasy 6- Mega Man 7 is often given the unfair jurisdiction as the turning point for when the classic Mega Man series took a dive in quality following the 8-bit era. I, however, would disagree with that assessment. Mega Man 7 is worthy of being held in the same regard as its predecessors on the NES. The platforming is just as tight and engaging. The visuals are impressive, but the level design has been adjusted to accommodate the larger and more detailed sprites. There is also an impressive amount of forethought put into each level, with certain powerups having an effect on the environment in which they're used. For example, the Freeze Cracker causes it to snow when used on Cloud Man's stage. Thanks to all this attention to detail and successful transition of Mega Man's gameplay to 16 bit, Mega Man 7 sticks out as a phenomenal platformer on a system with tons of great titles in the genre. Oh yeah, it's Mega Man X! This game rocks! There's so much to love about X's inaugural adventure! The zippy gameplay, the rad soundtrack, the awesome new art direction, the tight controls. It's a well rounded package with no fat and practically no low points. 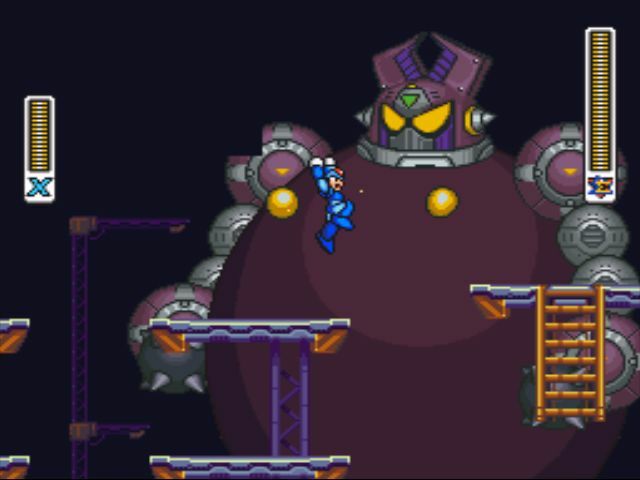 The new item collecting mechanic helped to bring things to the next level with Mega Man X. They made the most of X's expanded movement options and encouraged players to do more than just race from point A to B. In your hunt you could visit a level to find that it has changed based on previously defeated bosses and your means of traversing it have changed. This is great because it allows players to make the game easier or harder at their discretion. Struggling to make progress? Go hunt for some life expansions. Is the game too easy for you? Skip some upgrades. Look, what I'm trying to say is that Mega Man X expands upon the original series in every way and it is freaking awesome. A lot has been said about Earthbound and I don't feel completely qualified to talk about it. Dedicated fans have been singing this game's praises for decades and here I come having only played the Wii U port 3 years ago to proclaim "Yeah, Earthbound is something special." It's gotta be kind of insulting to the longtime fans. Regardless, here's my spiel. 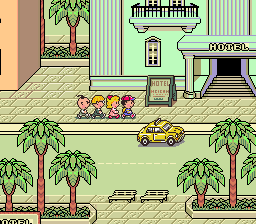 Earthbound isn't about the journey so much as it is the destination. It's a game about a kid who goes on a quest, sees some strange people and some bizarre things, and then goes home. It's the wonder and confusion of childhood, the fear of brushing up against things you can't quite understand but carrying on in faith that things will work out for the best. Few things make complete sense and you're not really sure what it is you're trying to accomplish in the grand scheme of things, but the people you meet seem to have this faith that you'll make a difference- that you're a good kid. It's about the optimism and innocence of youth. Sometimes we need to be reminded of that simple sense of joy and hope to deal with our adult problems. This will probably make me sound like a pretentious hipster, but Earthbound isn't really about the gameplay or the mechanics or the level design; it's about what it makes you feel and the sense of adventure it inspires within you. Yeah, Earthbound is something special. Mega Man X2 tends to get overlooked in favor of the original. While both games are without a doubt great stuff, I think X2 is better in almost every way. The levels are better designed and offer more variety; the soundtrack rocks even harder; and the upgrades push the envelop even further. It's got everything that was good about the original Mega Man X, plus an extra injection of creativity and polish. Mega Man X2 isn't incredibly inventive, but it improves on the original in a bunch of little ways that really elevate it. The power-ups feel more substantial, the optional bosses are a nice addition, and the gameplay and presentation are even better. It's almost perfect. My reasons for liking Donkey Kong Country aren't as complex as some other games on the list. In fact it's pretty simple. Donkey Kong Country has some of the tightest level design and control I've ever seen in a platform game. Just moving, running and jumping on enemies feels incredibly good. The weight behind the characters, and the little "bomp" sound that plays when you land on an enemy make movement an intrinsically rewarding process. Couple that with level design that encourages a sense of flow as you navigate obstacles and string together percussive hits on enemies and you get one of the finest games I've ever played. This is enhanced by the a fantastic soundtrack and a strong sense of atmosphere. Even though the graphics haven't aged incredibly well, when accompanied by the soundtrack they create the sensation of being lost in the wilderness. The presentation is dedicated to creating this sense of being in the Country. So when you stumble upon King K. Rool's factories and acid lakes, they truly feel like this perverse intrusion upon DK's natural homeland. Everything about Donkey Kong Country is just wonderful. Perhaps more than any other game on this list, DKC is a game I can just pick up and have a good time with no matter what. A Link to the Past is nearly perfect. I can't think of a thing I'd change. From beginning to end, the experience of playing this game is silky smooth. It has aged perfectly. A Link to the Past gets practically everything right. The Dark world is wonderfully implemented, offering a unique dimension to exploring the world. The expansion to Link's abilities and arsenal add a nice amount of variety without being overwhelming. And there's a great mix of optional quests and items to accompany the main story. The dungeons really steal the show here, so it's a good thing that they are so numerous. They all evoke their theme both visually and mechanically without getting in the way of the snappy gameplay. It's very easy to fluidly move from room to room, smoothly clearing enemies and terrain. A Link to the Past is yet another near perfect game on the SNES. How do you top the nearly perfect Donkey Kong Country? Crank the atmosphere up to 11 and throw in a nice sense of challenge. Donkey Kong Country 2 brings back everything that was good about the original title, but this time even the gameplay contributes to the sense of immersion more than ever. Just as Diddy and Dixie are in this frightening, demented island, the player is having their abilities tested by the level design. Both the characters and the player feel entrapped in this hostile structure that is trying to destroy them. Make no mistake about it, DKC2 is hard. At this point, I can get through the original without much trouble, but to this day DKC2 gives me a run for my money. However, the challenge never feels unfair. It's all about your ability to manage the characters as they rhythmically bounce off of enemies and navigate obstacles. Throw in the occasional well implemented gimmick and you've got a superlative platformer. Nothing I've played on the SNES compares to the sense of satisfaction from playing this game. Not only do the inherently enjoyable movement and controls return, but they're accompanied by tricky levels that are just begging to be overcome. It's a delicious challenge with a phenomenal payoff. Donkey Kong Country 2 is the best the SNES has to offer. And that's the list! I think it came out a lot better than my NES list. The games were more varied and I think what I had to say was more interesting. Plus, the games are considerably more varied, even if there are still a fair number of platformers. Hopefully you enjoyed reading it. Regardless, thanks for taking the time to make it this far. I'll probably do an N64 list at some point in the future. That one will be even more varied (but of course I'll manage to include at least one 2D Platformer, come on now). But for now, be sure to let me know what you think. I was poking fun at some criticisms in the snarktastic intro to this list, but I do appreciate the feedback. I could never have gotten 102% without the guide back in the day. Some of those DK Coins were just way too obscure for my liking. Aside from iffy moments with collectibles, I'd really have a hard time picking things from that game I don't like. I loved X2, but I remember it being...shorter than the first game? I feel like I remember the levels in X being longer and more satisfying. X3 went too overboard with levels dragging on for too long. I actually applaud you for not putting Chrono Trigger on the list. Having watched Amanda play it recently, I don't think it's nearly as perfect as people make it out to be. Nice list of Mega Man and Donkey Kong Country ga... oh this was a top 10 SNES list. Nah actually it's hard to disagree with most of these. Though neither DKC 3 and Mega Man 7 quite did it for me. Yo I thought this was a Mega Man list! Where's Mega Man Soccer? @PogueSquadron I distinctly remember one DK Coin that was hidden in a bonus room. I had to look that one up, and I felt a little cheated about it. I'm pretty sure I found all the rest on my own. DKC2 is indeed a fantastic platformer. You got my top three on there (Super Metch, FF3 and EarthBound) so I can't complain! Although like Zero, I never really fell in love with MM7. DKC2 is a true classic and very replayable. Definitely one of my top platformers. Ouch... no love for Kirby Super Star? Probably my favorite Nintendo game of all time. Chrono Trigger isn't mainstream. You should have put it on your list. Not only would it have benefited your "snobby hipster" image, it would have legitimized your SNES list. Because Chrono Trigger is easily the best SNES game of all time, hands down. I could probably fill up another list with honorable mentions. Super Start would be near the top; I adore that game. The real reason I didn't put Chrono Trigger on here was because I played it years ago, never finished it, and remember very little about it. But that isn't interesting. By the way, have you heard of Yoshi's Island? Probably not because it's so underground. What I'm trying to say is that I'm better than you for liking a certain game. I initially wanted to use this post to do a top ten...but I was leaving off too many great games! I think it speaks to the quality of the SNES library that most of the games in the top ten are better than ALL of the games on a few other Nintendo systems. IMO, of course. Even the runners-up list is good stuff: Contra 3, Secret of Mana, Secret of Evermore, StarFox, Super Mario Kart, Lufia and the Fortress of Doom, Earthworm Jim 2, Killer Instinct, DKC3, Mega Man X3, ActRaiser, Tetris Attack, Illusion of Gaia. Not to mention the Super Famicom-only Dragon Quest V and VI, the former which would definitely make my top 20. I wonder if Seiken Densetsu 3 would make a lot of these lists if it was ever released outside of Japan. Yeah! The SNES library is stupidly strong! It's one of my favorites. And this is still leaving out Super Punch-Out, Pilotwings, Super Mario Kart, Tetris Battle Gaiden, and Goof Troop. I could include any of these without feeling like I'm stretching just to fill out the list. The SNES is so good! And then there's games that I haven't played enough of or recently enough to have a solid opinion on, like Mario RPG, Chrono Trigger, and the two Fire Emblem games. I'm confident that any of these games has the potential to crack the top 10 whenever I get around to them. Putting them all in a list would be tough. I'll have to see what my ratings say (and if they need to be adjusted). Fine I guess I will make a list. Sort of in order but I change my mind given my mood.